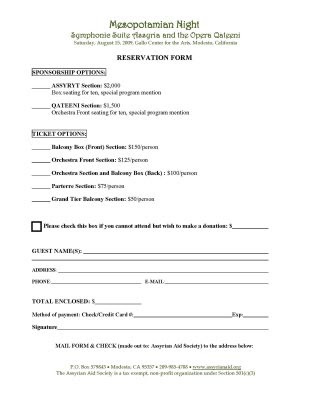 The following document is the reservation form for our third annual fund raiser event in Modesto which will be held on August 15th in Gallo Center for the Arts. This year's event is titled "Symphonic Suite Assyria and the Opera Qateeni". Please consider reserving your tickets early on by sending your reservation form (click on the image to get an enlarged version). This will guarantee better seating assignment. The tickets are also available online at the Gallo Center's Website.